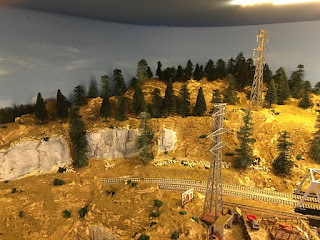 Building distant pine trees and making them look small enough and distant is difficult. 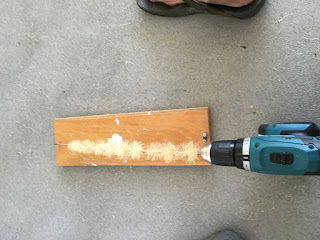 Most of my pine trees are made using horse hair and wire made using the "bottle brush" method. These trees are great and probably better than the $2+ each packaged N Scale trees I have several packets of. But they take time to make and I need many hundreds of them. 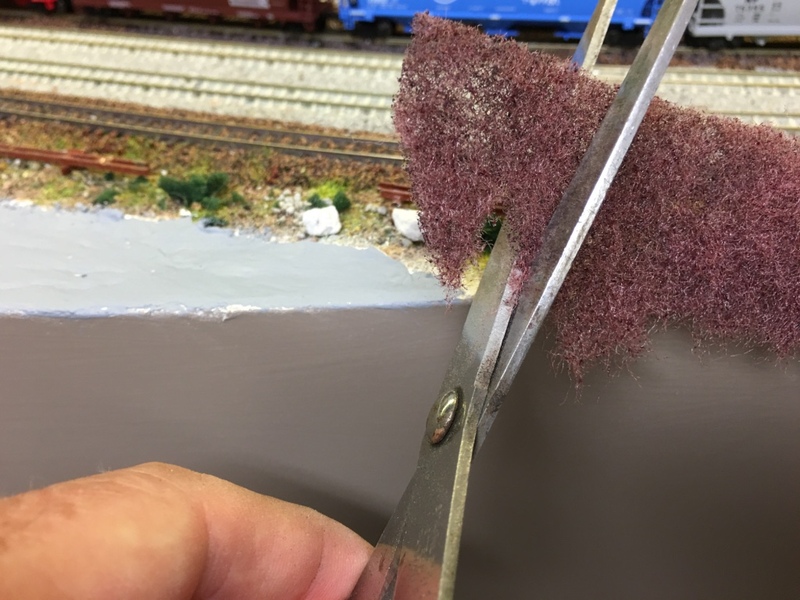 So I am not sure who I have to credit this idea with, but I use scourer pads. Some other people I remember use air filter pads. The good thing about scourer pads is that they are not metallic, so no danger of fouling motors. However the hair is fine so you need to vacuum after, like any scenery development. I had started foresting my California hillside when I realised I needed over 1,000 trees. So I looked for another way of providing the backdrop layer of trees that looked realistic. Here are my results and step by step instructions. Here is a mountain covered in commercial plus horse hair pine trees. 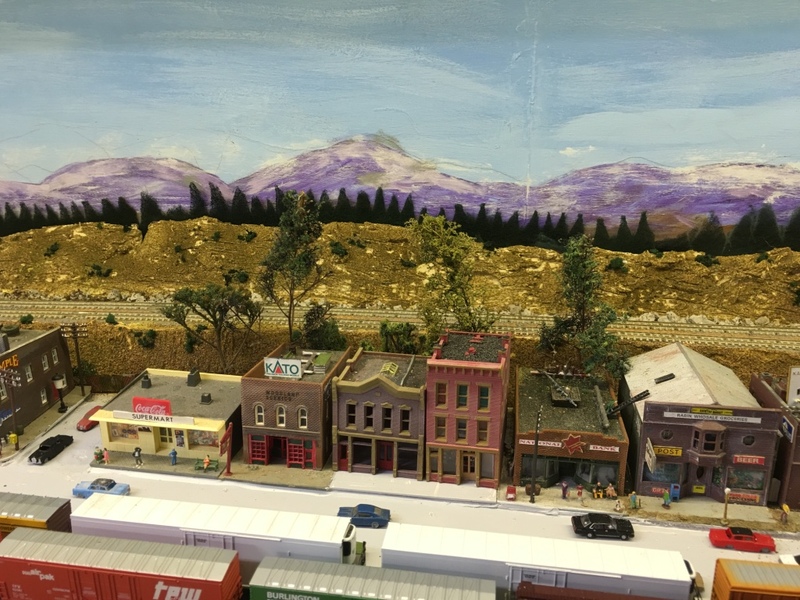 The hills / mountains on the BNSF Down Under are built away from the painted backdrop to give the image of depth. The gap in most places is a centimetre or so, but it stops the hills butting against the backdrop. Here are some finished background scourer pad pine trees in place. 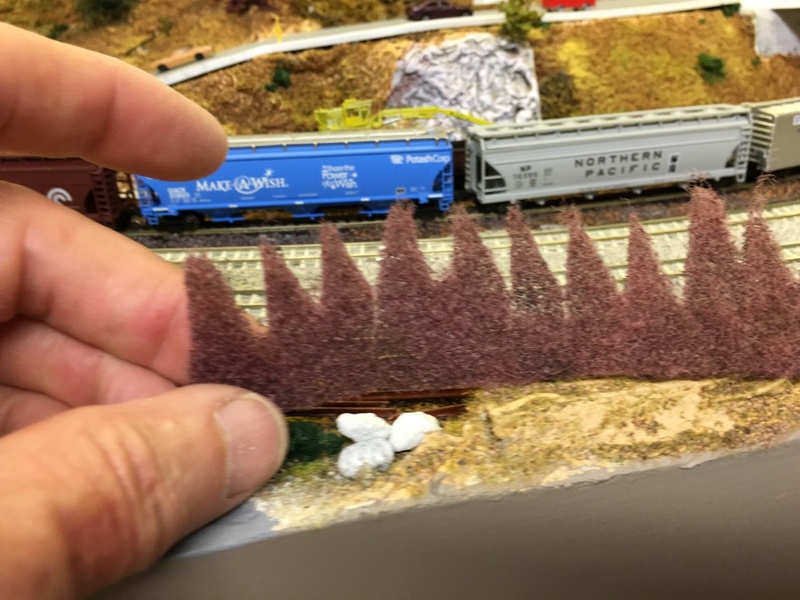 Here is a view of the scourer pad pine trees below the snow peaks of northern California. So here is a Scotchbrite scourer pad - in this case brown. 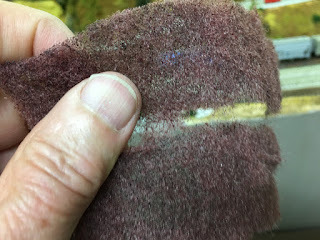 I discovered you can buy very cheap scourer pads of "No Name brand" in supermarkets and some $2 shops. I got my last batch from Woolworths for $1.49 for 6 pads. Six pads will make over 3 meters of background trees - more than 10 feet. As they come the pads are too thick but can easily (carefully) be split to create thinner sheets. 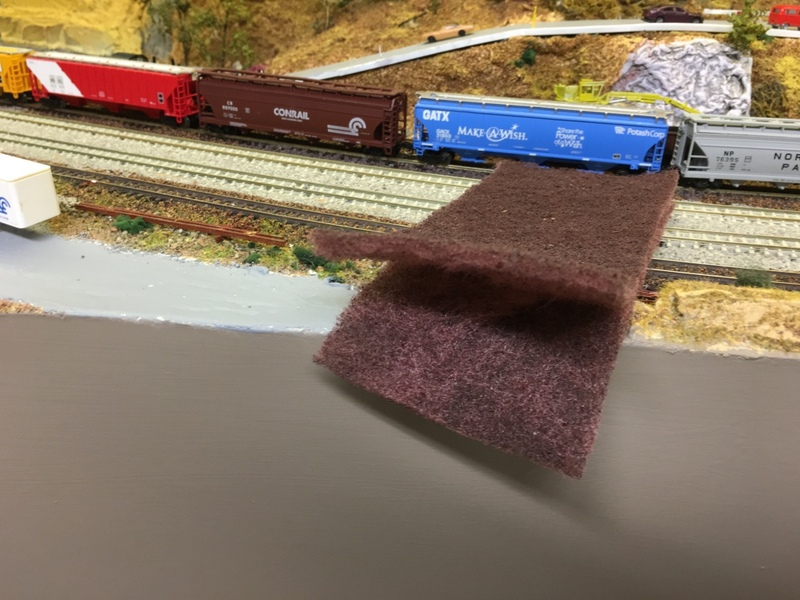 Here is a pad being split. My pads were 150 x 80 mm (6 x 3.5 inches). A height of 40 mm is plenty for the backdrop trees so you can get 4 lengths from every pad. By thinning the pads the trees are slightly opaque which is more like a regular tree. The thinner trees now have texture which adds to the final appearance. Once you have the 150 x 40mm strip ( a quarter of the original pad) you can now cut the pine tree shapes. Angle the trees like a pine tree and only make each tree about half of the 40mm pad depth. The uncut section will be behind your mountain or hill. Keep the sections you cut out as these can be used as individual pine trees on the backdrop. Here is a cut out 150mm (6 inch) set of trees. 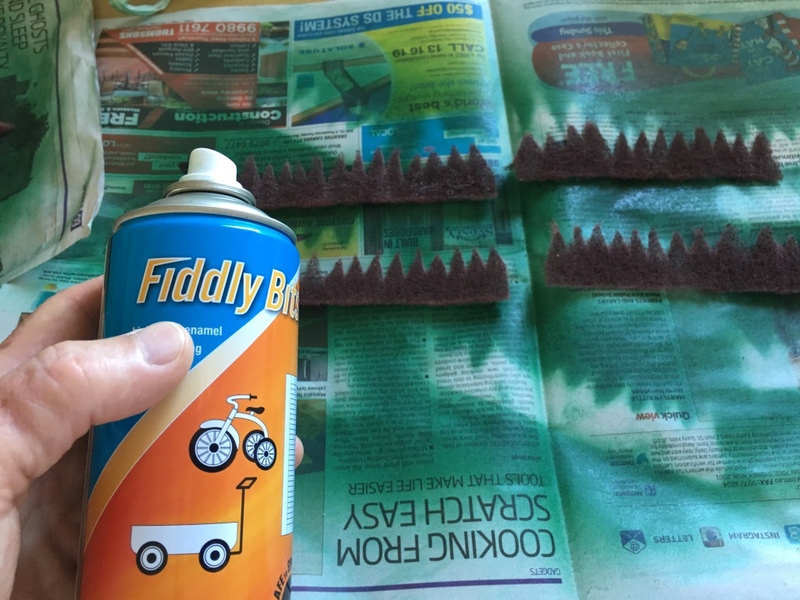 As these trees were brown I spray painted them with a cheap dark green spray paint. Any spray paint will do but even with acrylic paint do it in a well ventilated area. Just for reference here is a group of 8 bottle brush trees about to be spun. 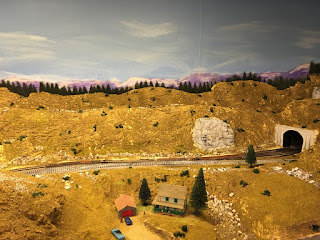 I still use bottle brush pines on all the layout except for the background. 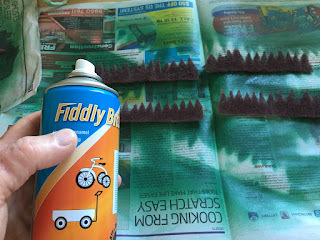 There are many blogs and articles on the web to make bottle brush pine trees. It is a good therapeutic exercise and one that can while away many hours - if so inclined! So here is a finished section. 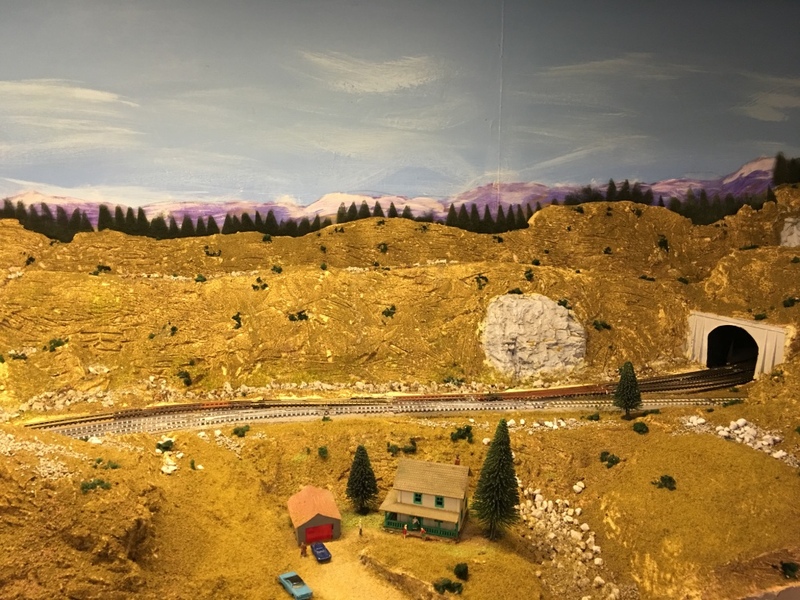 In most cases the background pine trees fit snugly between the mountain and painted backdrop. If there is too much gap then I use styrofoam to pad that gap so the trees are against the backdrop. So give this method a go if you need pine trees. It is relatively quick and the results are pretty good.